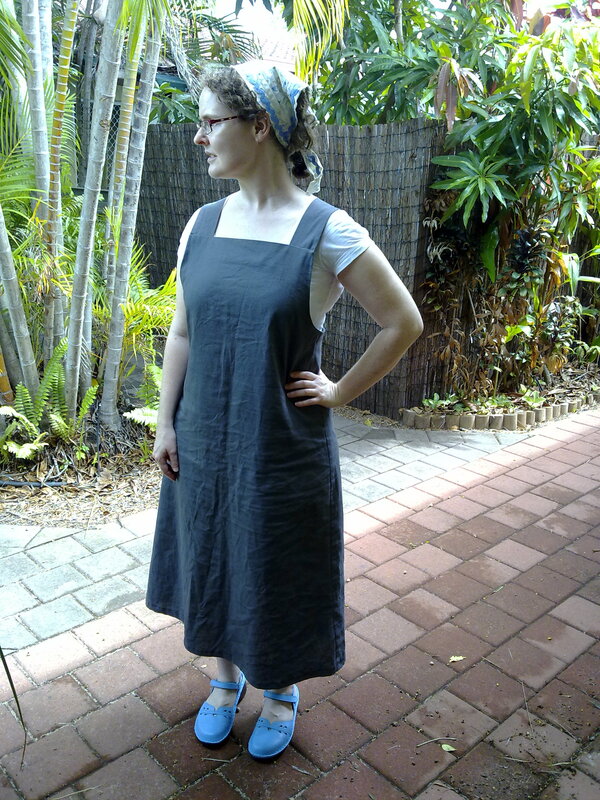 This TNT grey linen pinafore dress was never really a UFO, rather just something I hadn’t gotten round to sewing yet. There is a difference! A friend I was teaching how to sew, who was the exact same size as me, fell in love with my TNT pattern, butterick 2620. Since it is simple, it was ideal for her to learn how to sew with. However, between cutting out and sewing, she fell pregnant. Now in her third trimester with twins she is, oddly enough, nowhere near the same size as me – and isn’t foreseeing being so any time in the near future, so she gave it to me. 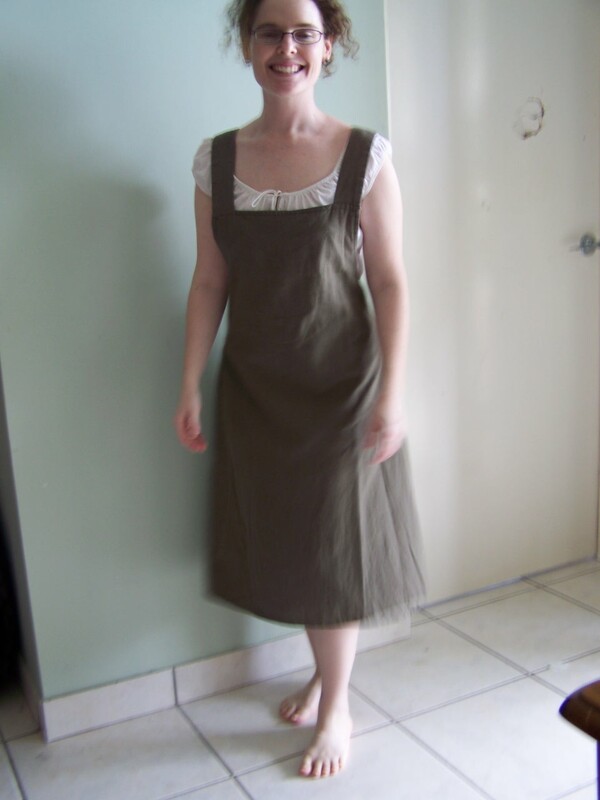 So I sewed it up as part of my UFO October blitz, and lo and behold, I have yet another version of this pinafore tunic. I think I am up to 6 now? Not all at once, you understand, usually only one at a time I then proceed to wear to death. Then get all fidgety from the loss of it in my wardrobe. So I sew another. And life goes on. The head scarf is one I made from some craft cotton, the edging is a raw bias edging that gives a lovely soft look to it, in keeping with the soft yellows and blues in the fabric. I realised the blue in the scarf is exactly the same blue as my Blue Shoes of Happiness. So of course I had to wear them too! The grey linen dress is taking over from this green linen one! The date-stamp on this photo is 2007, and I had already had it a while when I took this photo. Yay for linen! it lasted with all its hard wear and lots of washing, in this climate for 4 yrs. WOW!!! And it was devastating to see it so threadbare and tired. I love that dress!!! I would love it in my size !!!! And your shoes are awesome too. Oh, and I can’t get over how just painting the shoes worked! I want a rainbow-coloured shoe closet now! Oh thankyou! See why I’ve made so many in the past? Hey what do you think about the length? I am pondering shortening it to a similar length to the green one. Speaking of lovely dresses, am I gonna be able to put up here a piccie of your dress, so I can proudly show off my student’s work? Love the shoes. Great colour. It’s great to find a pattern that really speaks to you and that you feel good in. I think if it were me, I’d opt for a shorter dress for two reasons. Firstly, I find this length a bit hot to wear, even if made in linen. Also, it falls into that tricky calf area which can make people look a bit short or frumpy. I’ve never been able to pull off that length either physically or mentally but obviously you can if you’ve already been doing it comfortably for four years. It’s hot here too! Yes it is lovely to have a TNT pattern that has been thus for oooh well over a decade! Thanks for the feedback, it is helping! I am short already, so frumpy is scarily easy to achieve 😦 And a more definite length – either shorter or longer – usually does look better. And boy I’m hearing you on the hot! How hot is it there at the moment? Our build-up has been reasonably kind to us this year, but it is still, well, the build-up *meep* and any clothing, even the coolest of styles seem too long, too thick, too HOT!!! The pinafore looks really great! I do think a slightly shorter length would look better, and also be a bit cooler. 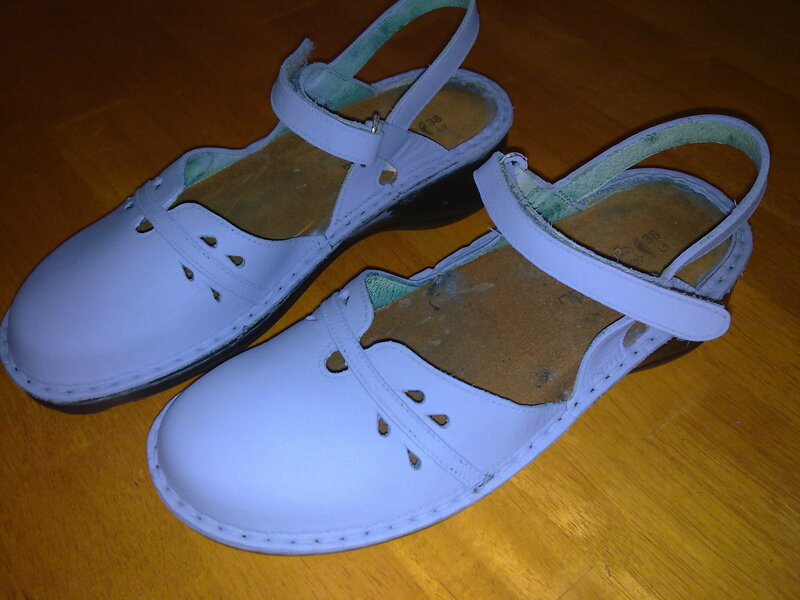 The shoes turned out really well too. Oh, and the head scarf. Amused that your photographer didn’t realise it was a new garment. I love the lushness of the garden too. It is cold and raining here, will it never stop? Hi Cherrie, no I don’t sew for money usually, it just doesn’t appeal so the clothes never get sewn. Also I charge a decent-to-me return for the hours sewn, which makes the clothes so expensive most people wouldn’t pay for it. Especially these days with cheap clothing retailing as the norm. However I don’t mind sewing things for profit occasionally. Firstly, the actual sewing, I’d probably charge around $80-100, more if you are a difficult size to fit. 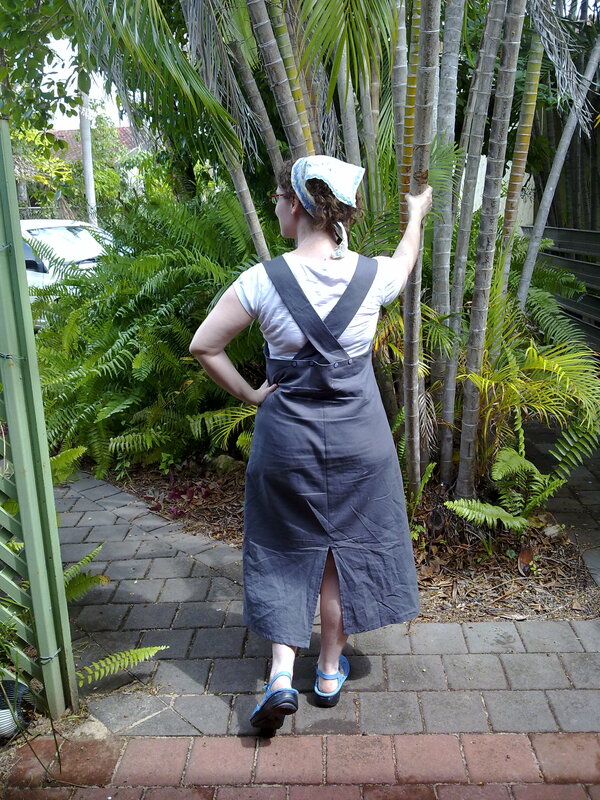 And to get a nice linen pinafore, you’d be looking at 2m (Depending on length) at around $25 per metre. So if you’re interested in paying around $150 for each one, I’ll probably do it. Then postage on top. You’re in Aust? postage maybe $17 for both of them, tracked etc. Let me know if you’re still interested! Hello! 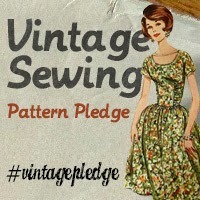 This is such a lovely pattern – do you have any idea where I could get my hands on a copy please? I love your blog! It’s gorgeous isn’t it 🙂 So easy to make and wear, as well as, in its simplicity showcasing beautiful fabrics. 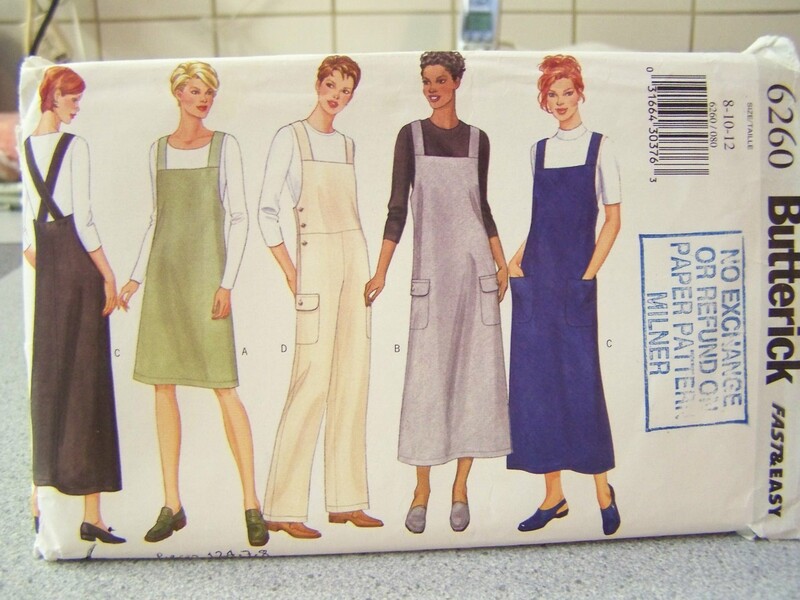 Hi, where can I buy a pattern for the apron-like dress? No idea sorry! I’d look on ebay or Etsy for it. Good luck!